Anyone needing any "look -ups" from this Regtl. History, let me know. I am researching a soldier on the Rhayader Memorial who was with the 11th Bn. and was kia on 18th November 1916. Would you please let me know what it says for that date. A couple of things which came to mind when reading through the account: If the Battle of The Somme officially finished on 17th November 1916 what would the Battle on the 18th have been known as; is that a daft question ? Also I can not help wondering what the rest of the last sentence says. There can be no doubt that some ............? I have wondered about that as well. The action at Fankfurt trench actually lasted from 18th to 25th Nov, so if it was officially no longer part of the Battle of the Somme, maybe it was classsified as a raid? 6th Battalion The Border Regiment on or around the 25/7/17 . If you're still willing to do Border look-ups, I have two. The first is for the 2nd Bn for 28 June 1915 (8164 Sergeant John Arthur, D Coy, KIA) and the second for the 8th Bn for 21 October 1916 (Acting Captain Walter Patrick Watson-Thomas, KIA). Many thanks. "...officers and men fought their way right through to the objective." I would have been wondering how the sentence ended every time I read through the information. Fred Farmer who went through Gallipoli with the Herefords must have wondered what he had done to deserve such experiences when fighting in the freezing November conditions of the Somme. Huge thanks for the extracts from the Border Regiment history, Dave. 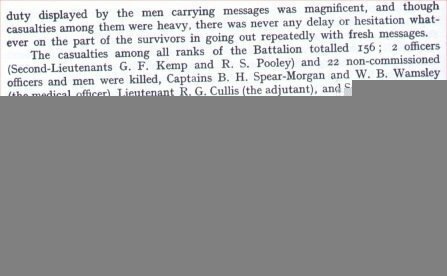 It seems as though Serjeant Arthur may have been a casualty of routine shelling or sniping. Although we tend to think of this as 'background noise' to the major events and offensives in the First World War, each of these deaths, as I'm sure we know, had a devastating impact on the family back home. When I get a chance I'll go back to the battalion diaries at Kew and see if there's any more information that might suggest how he died. Captain Watson-Thomas seems to have met his end in altogether more gallant but nonetheless tragic circumstances. Can you let me have some details for the 8th Bn. on 5th July 1916 and the 1st Bn on 5th May 1917? Sure can, Andy. (though neither battalion was really up to much on the dates that you mention). ...the next 2 "snippets" cover the 1st Bn between 25th April 1917 and 15th May 1917 (nothing in particular mentioned for the 5th May). Something just struck me after re-reading the above post!. Can anyone tell me why 2/Lt.V.Blomfield (wounded) seems surprisingly familiar to me ? Sir Reginald Blomfield was one of the IWGC architects.............some relation perhaps? Can I trouble you to let me have the details for the 8th Bn Border Regt for the period 1st July to 4th July as well? I have done some checking against both SD and the CWGC and it looks as if 5th July is another 'date of convenience' and probably represents the date when they were first able to do a proper roll call. If not then there were a lot killed and commemorated on Thiepval on a day spent largely in the supposed peace of Aveluy Wood ! Can I jump on your merry little bandwagon? Any chance of details for the 2nd Battalion in June 1916? All the (rather unhelpful) War Diary tells me is ""12/6/16/to/18/6/16 In trenches (casualties 4 killed, 9 wounded)". It's one of the wounded, Private James England, who died on 23 June, that I'm interested in. Here you go Andy (I was expecting this request! ), (2 posts).